Acquisition of P-8I, LRMR&ASW aircraft has substantially augmented the long range and long endurance capability to remain on task for surveillance and reconnaissance missions. Recognising the imperatives of a well-balanced and credible naval air arm’s significant role in building a true-blue water capability, Indian Navy’s Maritime Doctrine has rightly incorporated comprehensive modernisation plan for its Fleet Air Arm through a two-pronged approach. 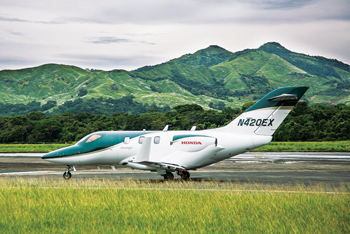 The mid-life upgrades and the process of modernisation of existing aircraft, and through the acquisition of state-of-the-art and versatile top-end technology-based aircraft and incumbent capabilities. The critical staff requirements for the acquisition of sophisticated platforms include; state of the art sensors, communications and weapons, advanced avionics, aero frames and aero engines. This strategy has realised rich dividends as is evident through big-ticket deal of acquiring P-8I, Long Range Maritime Reconnaissance & Anti-Submarine Warfare (LRMR&ASW) aircraft from Boeing through direst Foreign Military Sales from the USA. 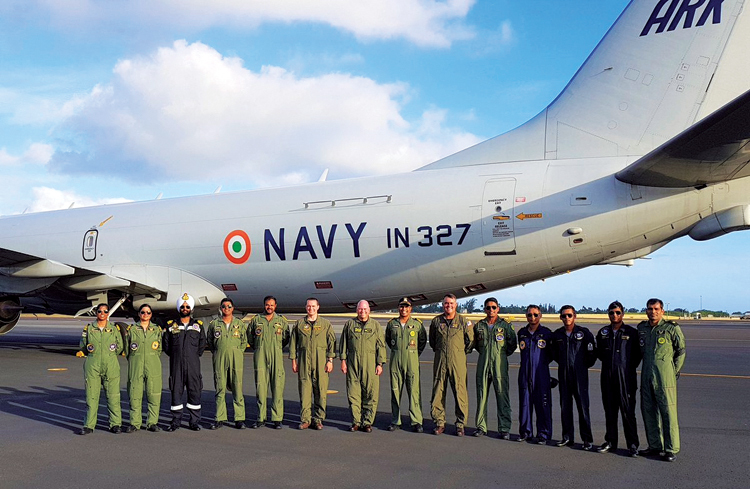 Post the initial order of eight aircraft Indian Navy has exercised the option clause and ordered four more P-8I, totalling to an inventory of 12. Acquisition of P-8I, LRMR&ASW aircraft has substantially augmented the long range and long endurance capability to remain on task for surveillance and reconnaissance missions. This versatile platform has emerged as real game changer and substantially contributed during operational deployments of Indian Navy fleet, be that own operational work-up, bi-lateral and multi-lateral exercises with foreign. During Humanitarian and Disaster Relief missions, P-8I has rendered yeoman service. Submarine deployments from hostile countries are most effectively tracked right from the time of entry in to Indian Ocean. P-8I has been deployed way beyond the conventional reach and has earned accolades when deployed to operate from Indo-Pacific Fleet Headquarters, Australia, Japan, etc. Encouraged by the global response in offering the advanced technology that is unmatched in the Long-Range MR aircraft segment, a global RFI was floated for Medium Range Maritime Reconnaissance (MRMR) aircraft to replace the fleet of 10 Islanders. The Defence Acquisition Council of the Ministry of Defence has accepted the necessity for procuring nine MRMR aircraft for the Indian Navy. This project, however, appears to be in limbo. Short Take-off But Arrested Recovery (STOBAR) scheme was approved both for the Indigenous Aircraft Carrier, IAC-1, Vikrant and the modernised and refurbished INS Vikramaditya. Accordingly, MiG-29K fighter aircraft was selected for the two carriers. The induction of MiG-29K, multi-role fighter aircraft with air combat, ground attack and maritime strike capabilities has proved to be a potent combatant for the Carrier Battle Group (CBG). The aircraft with its air-to-air ‘Infra Red’ and ‘Beyond Visual Range’ missiles, guided and unguided bombs, anti-ship missiles, datalink capability, a credible EW suite and buddy tanking, makes it a versatile and potent fighter aircraft. MiG-29K has stabilised as frontline fighter aircraft of Indian Navy and its operational availability has steadily improved. The 40,000-tonne IAC-1, Vikrant which is presently under construction at Cochin Shipyard Ltd. And expected to be inducted by 2020, will deploy about 30 combat aircraft mix of MiG-29K and LCA (Navy) in Short Take-Off But Assisted Recovery (STOBAR) configuration. Considering the inordinate slippages in the development process and serious technical glitches relating to weight to power ratio, Indian Navy has ruled out LCA (Navy) for IAC-1, Vikrant. Consequently, Indian Navy has begun a search for a Multi-Role Carrier Borne Fighters (MRCBF) for IAC-1 and its followon. The RFI for 57 MRCBF had elicited response from all leading global MRCBF manufacturers to answer queries on technical parameters, budgetary estimates, likely level of indigenisation, transfer of technology and schedule of deliveries after a contract is inked. RFI required details whether the aircraft is single or twinseat (or available as both), and if it has one or two engines; whether it can perform STOBAR or Catapult Assisted Take-off But Arrested Recovery (CATOBAR) operations, or both; whether the aircraft is already in operational use or not; whether helmet-mounted displays and large-area displays are integrated and fitted; is auto-landing an option; and whether or not an Active Electronically Scanned Array radar is fitted. Currently, six aircraft are compatible, namely; Dassault’s Rafale, Boeing’s F/A-18 Super Hornet, Russian MiG-29K, Lockheed Martin F-35B and F-35C, and Gripen from Saab, Sweden. While F/A-18, Super Hornet, Rafale and MiG-29K are twin engine jets, the remaining three have single engine. Responses received to RFI are under an internal evaluation to arrive at the best option. RFP is expected to be promulgated shortly. Those in the reckoning could be Boeing’s F/A-18 Super Hornet, Lockheed Martin’s F-35 and the Dassault’s Rafale both possessing the naval versions which operate in the CATOBAR mode. Responses from the vendors have been comprehensive and are presently under examination. The aircraft selected would be such that changes required to the existing aircraft carriers to operate the aircraft, if any, would be minimal. The RFP for 57 MRCBF is likely to be issued in 2019. The second Indigenous Aircraft Carrier (IAC-2) expected to be an electric propelled, 65,000 tons CATOBAR Carrier. At present, the case is being examined and deliberated in MoD with reference to the overall financial implications of the Project vis-à-vis Indian Navy’s long-term budget availability. After receiving the ‘Acceptance of Necessity’ (AoN), the design feasibility study will be undertaken in-house for which the Navy will seek consultancy from a reputed design house. The exact scope of work and timelines for execution of IAC-2 can only be done after AoN is received and design feasibility study is complete. IAC-2 is being designed to meet the requirements of Indian Navy in the challenging future strategic environment. The carrier will provide critical capabilities to the future naval force, which would be central to Indian Navy’s operational philosophy to secure national maritime interest in the future. The acquisition of Kamov 31 AEW helicopter from Russia has proved a versatile platform in the segment of airborne early warning to beef up surveillance at sea. Encouraged by its established capability and performance at sea, additional units of Kamov 31 helicopters are being acquired. However, the rotary wing based capability is restricted by limited endurance of the platform at sea. 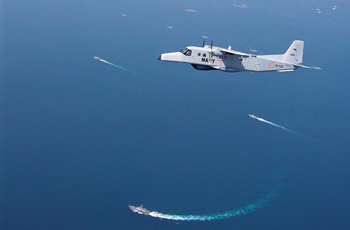 What Indian Navy really requires is the intrinsic AEW capability through fixed wing aircraft to meet the long term requirements of power projection, dominating the littorals if and when required, and to influence the land battle. Indian Navy does not seem to have a choice for an intrinsic carrier borne fixed wing AEW aircraft. The Sea King 42B and Kamov 28 helicopters, in ASW and anti-ship strike roles and integral to ships have also aged and need to be replaced with Multi-Role Helicopters (MRH). The procurement of adequate number of MRH is essential for the growth of Rotary Wing Fleet. More than a decade ago, the Indian Navy began the process of finding a suitable replacement for the Seaking helicopters by floating a global tender for 16 helicopters with an option clause for another eight, in 2008 for its warships and for upgrading diminishing ASW capabilities of her fleet. In the open bidding process, the US firm Sikorsky was selected in December 2014. Sikorsky emerged as the sole successful bidder, after the Italian firm Finmeccanica (now Leonardo) was ruled out of the competition due to the allegations of scam in VIP helicopters deal by the Government of India. Seahawk S-70B was selected for its advanced ASW and anti-surface warfare capabilities to take on the underwater and over the surface threats. However, MoD foreclosed the procurement of 16 S-70B Seahawk helicopters from Sikorsky for various reasons. Finally, the Defence Acquisition Council (DAC) on August 26, 2018 has approved procurement of 24 MRH. Availability of MRH with the Navy would plug the existing capability gap which is the most critical need of Indian Navy. This contract when fructifies will be another direct Government-to-Government (G2G) deal, also known as Direct Foreign Military Sale (FMS) with the US and worth approximately $1.8 billion. MH-60R helicopters are also designated as Seahawk multi-mission helicopters, capable of ASW and anti-surface warfare roles. Consequent to approval of the Government a “Letter of Request” was issued on November 15, 2018, to the US Government to acquire 24 Naval Multi-Role, MH-60 ‘Romeo’ Helicopters at a cost of 13,500 crore (approximately $1.8 billion). The request for the helicopters is made as an “Urgent Requirement”. 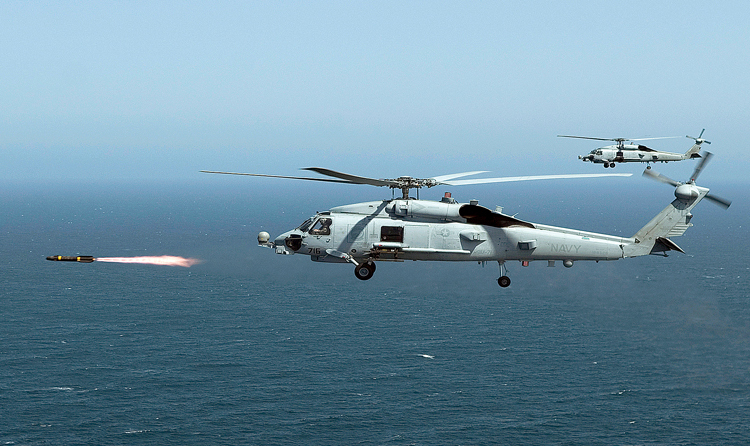 The MH-60R, Seahawk considered the world’s most advanced maritime helicopter will be armed for the ASW and anti-surface warfare role and will be duly fitted with missiles and torpedoes. The acquisition of 24 MH-60R Seahawk helicopters opens new vistas for the Indian Navy’s long-term requirements for 123 Naval Multi-Role Helicopters (NMRH) and 111 twin-engine armed Naval Utility Helicopters (NUH) programmes under the ‘Make in India’ initiative and in partnership with the indigenous Private Sector under Strategic Partnership Model. The response to RFIs for both projects has been very encouraging. 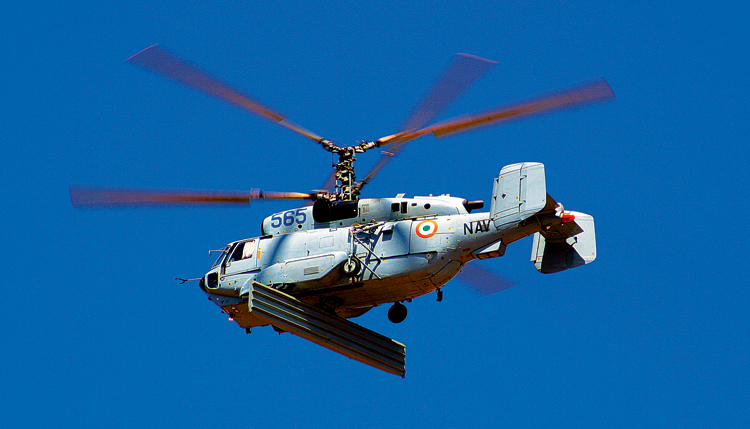 Several OEMs have shown interest towards manufacturing these helicopters in India. The NUH is the basic ship borne utility armed, twin-engine helicopter with relatively lesser complexities, which are likely to be inducted in a phased manner commencing 2024. The NMRH is a complex platform with sophisticated weapons and sensors. Therefore, the induction of NMRH may take one or two years more than the NUH. The most significant aspect of the Strategic Partnership is that it will facilitate the Indian industry in imbibing niche technologies in helicopter manufacturing which would benefit the industry as well as the Indian Armed Forces in the long run. The coming decades certainly hold enormous promise for substantial growth and empowerment of the Indian Navy’s Fleet Air Arm. With the kind of capabilities on the anvil, it would emerge as a credible force to tackle multi-dimensional challenges of the future and play its part in making Indian Navy, a truly Blue Water Navy with extended reach and prowess to meet strategic tasks in consonance with national maritime security imperatives.